For over a decade the Tanzanian state has tried to enlarge its share of mineral revenues generated by foreign large-scale mining (LSM) companies. Previous reforms – such as increased royalties and the mandatory stock listings of LSM companies in Tanzania – had not yet been implemented or did not provide the desired results. Consequently, the Tanzanian government under president Magufuli recently decided to look after the issue once again, thereby drawing upon a discourse of resource nationalism. According to the main argument, all natural and mineral resources found in Tanzania (such as gold, oil & gas, uranium and diamonds) belong to Tanzanians who in turn should profit from them. Consequently, an export ban on gold and copper concentrates, Tanzania’s main mineral export, was launched in March 2017. This ban on concentrates was supposed to result in the development of value adding activities in the country, particularly via the construction of smelters. Moreover, this export ban kicked off a series of events that are about to turn LSM in Tanzania upside down. To grasp the background of resource nationalism in Tanzania, it is crucial to note that LSM has historically been a foreign business. It has its roots in German and British colonial occupation. During Julius Nyerere’s socialist reformatory rule of the country (1961-1985) that followed foreign occupation, LSM operations were shut down to save the resources for future generations, and a time when Tanzanians would be capable of running the business themselves. Only the state-owned mining company STAMICO remained. From the 1990s onwards, due to Structural Adjustment Programmes (SAPs) and the forced liberalization of the Tanzanian economy (Butler 2004), foreign companies – this time Canadians, Australians and South Africans – once again started to dominate the mineral sector with support of investor friendly legislation of 1997 and Mineral Development Agreements (MDAs) dictated by World Bank. Nyerere’s strong legacy and mining revenues trespassing the country via closed channels of international finance and business structures (Ferguson 2005) contributed to a constantly growing discontent among the population and supported a resource nationalism discourse calling for government action. Influenced by this discourse of resource nationalism, the passage of the Mineral Policy of 2009 and the Mining Act of 2010 under Kikwete’s government was a first attempt to increase the country’s profit from its resources by increased royalty and tax payments, the implementation of local content policies that admonish foreign companies to hire local service providers and companies, and a compulsory listing of LSM companies at the Dar Es Salaam stock exchange. Nevertheless, what seemed to work well in theory, did not work in reality due to lack of implementation. The marginal effects of these mining reforms were grist to the mills of civil society members lobbying for even stricter legislation for large-scale mining operations. After the presidential elections of 2015, efforts to implement legislation were intensified by the new president John Magufuli, whose pronounced aim was a ‘clean-up’ of the nation – metaphorically as well as practically – by tackling corruption and patronage and to boost Tanzania’s economy by local value addition and a rigid tax and revenue collection system. Yet, the mining sector still did not meet the government’s expectations. Mining only contributed 3,7% to the GDP in 2014 – in comparison, tourism contributed 14% – and no value adding activities were established in Tanzania. Thus, the Magufuli government resorted to strict measures. As indicated earlier, in March 2017 an export ban for gold and copper concentrates was implemented. Moreover, two presidential committees were put in place to investigate the contents of containers owned by Acacia Mining that were held in the port of Dar Es Salaam and the same company’s past activities, due to suspicions of fraud and juggled export declarations. Acacia, the main gold producer in Tanzania and a subsidiary of Barrick Gold, was significantly hit by this move. According to company statements, it was losing 1 million USD per day at every of their Tanzanian mines and it claimed it would have to review its activities if the ban persisted. Consequently, merger talks held between Acacia and Endeavor Mining at that time were terminated. Despite all attempts by Acacia to achieve a cancellation of the export ban, the government stated that it would stay in place until the results of the investigations were published. On May 25th 2017, the report of the first presidential committee was released. According to this report, only 10% of the gold and copper concentrates in the 277 containers were declared for export. The export ban stayed in place. The outrage about the issue was massive. The media immediately reported about the alleged fraud, as well as about the collaboration between ministry officials and Acacia that facilitated extensive royalty and tax evasion. Once again, Magufuli’s ‘cleaning up’ approach started immediately. The same day, the minister of Energy and Minerals, Sospeter Muhongo, was told to resign and the board of the Tanzania Mineral Audit Agency (TMAA), the agency that was supposed to monitor the mineral economy in Tanzania, was dissolved by presidential order under the accusation of ‘complicity in the betrayal of the nation’. 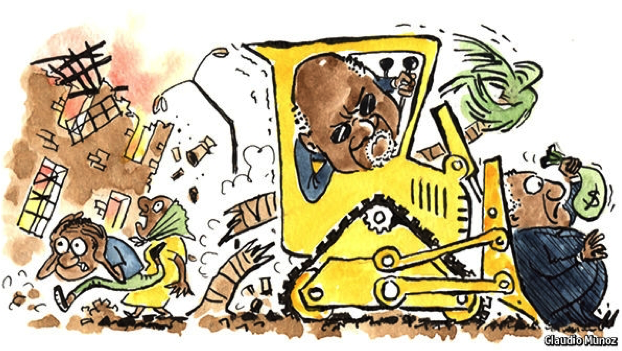 These quick and harsh interventions underlined that Magufuli is nicknamed ‘The Bulldozer’ for a reason, but also that he seems to be serious about the transformation of the sector to benefit Tanzania and eliminate obstacles within the government apparatus.. The consequences of these measures reached beyond the actions of the president and the Tanzanian government. Acacia’s shares on the London stock exchange dropped by 40% within two days and the company’s already mediocre reputation among Tanzanians got even worse. A few days earlier, Acacia threatened to lay off its workforce and close down its mines. 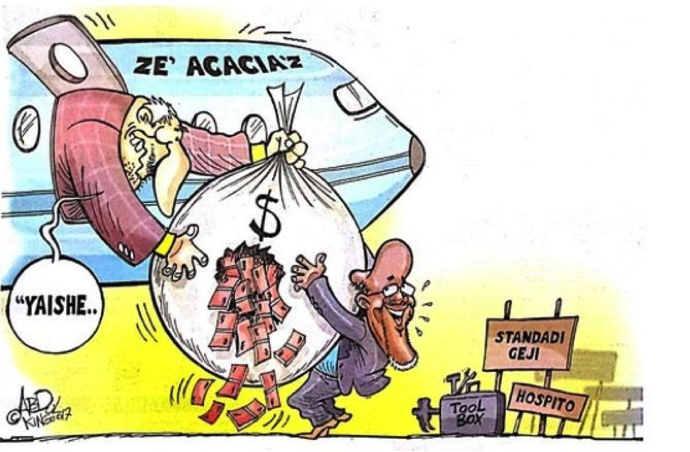 The report covering the past activities of Acacia, published by the second presidential investigation committee in early June 2017, stated that the company’s fraudulent administration of the past two decades caused financial damage of 30 billion USD to the country and even claimed that the company did not even have an operating license in Tanzania. Again, although it is difficult to verify these accusations, they do underline the government’s position and the pressure it lays upon Acacia. Besides, if Acacia as the major player in mining in Tanzania didn’t have an operating license for almost twenty years, that will only backfire to the government for not noticing. Eventually, Acacia’s mother-company Barrick entered into negotiations with the Tanzanian government. Given that in late July, no agreement had been reached yet, Magufuli announced that he will close down the mines and give them to Tanzanians. Just days after this announcement, the Tanzanian government handed Acacia a tax bill of 190 billion USD. Meanwhile, two new legislatory bills – one to increase royalties and a second to enable the government to renegotiate contracts signed in the 1990s – were signed in late June. These turbulent dynamics and the dispute between the government and Acacia, feed into a public discourse which is of the opinion that there is a need to drastically reform the sector, and that now is a golden opportunity to revoke mining contracts and get rid of the big mining companies. In turn a nationalization of the sector would be possible. Without doubt Tanzania now stands at a crossroads, although the desired path is clear. The country’s endeavor to challenge one of the largest players in the mining sector is a balance act, especially now that AngloGold has joined the game by taking Tanzania to court over the new laws. The impulsiveness of the current government and its tarnished opponent – Acacia’s shares lost almost 70% in value between January and August 2017 – only adds to its riskiness. Negotiations no longer seem to be the weapon of choice. Looking at the threats of compulsory acquisition and the 190 billion USD tax bill, it appears as if Magufuli is not even interested in reaching consensus, but rather in a nationalization of the mining sector and expelling foreign mining companies. In this regard two questions remain: Does ‘The Bulldozer’ pave the way for a new beginning in Tanzania’s mining sector, or will he leave a pile of rubble? And looking back at Nyerere’s vision, has the time now come for Tanzanians to take control of large-scale mining themselves? Only the developments over the next period will tell, but, in the meantime, the Tanzanian mining sector remains in stormy waters.